Unlike the slaughter of elephants and rhinos by poachers, the collapse of Africa’s giraffes has been quiet and overlooked. In only 30 years, continental numbers have plummeted by 40 percent. Recent population and distribution assessments of some subspecies paint a grim picture. Both Kordofan and Nubian giraffes were just upgraded to a critically endangered status on IUCN’s Red List of Threatened Species — altogether only approximately 4,650 mature individuals survive. The reticulated giraffe, one of Kenya’s signature wildlife species and tourist attractions in the north, has declined steadily and is now considered endangered. Maasai and Rothschild giraffes make up the remainder of Kenya’s total giraffe population, which has declined by up to 67 percent since the 1970s. Land conversion for agriculture and infrastructure development is shrinking the Maasai giraffe’s once-expansive range across central and southern Kenya and northern Tanzania. As human settlements grow in these wildlife-rich areas, competition for resources makes it increasingly difficult to conserve viable and ecologically functional wildlife populations. 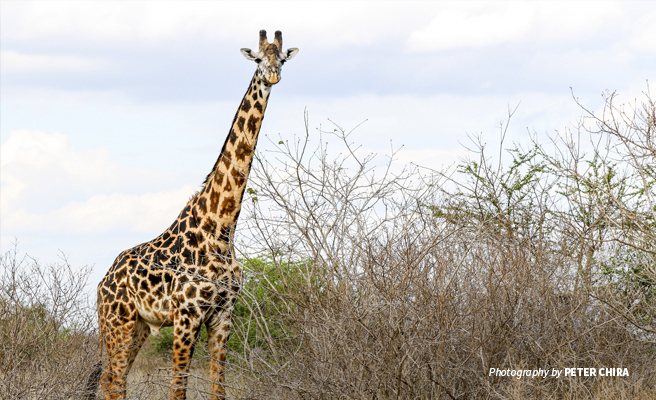 Not only are rangeland conditions shifting due to climate change, human activities like overgrazing and charcoal burning are also depleting the ecological integrity of the Maasai giraffe’s historical habitat. At the same time, local markets for bush meat and giraffe parts are cropping up, and poaching is emerging as a serious threat to the tallest land mammal. One of the Maasai giraffe’s main strongholds in East Africa covers almost 50,000 sq. kilometers, stretching across southern Kenya’s Tsavo landscape and Mkomazi in northern Tanzania. This large transboundary ecosystem is a mosaic of national parks and reserves, conservation areas, and livestock ranches. The savanna tree woodlands and thickets are an ideal habitat for many wildlife species like the giraffe, but the density of agricultural land, settlements, and infrastructure is expected to give rise to new challenges. Although the giraffe population in Tsavo-Mkomazi almost doubled from an estimated 2,891 in 2014 to an estimated 4,323 in Feb. 2017, data also suggests that giraffes outside fully protected zones are increasingly threatened. Without the ability to move safely through the community conservancies, agricultural land, roads — and over borders — population isolation will continue to impact the genetic health of the species. 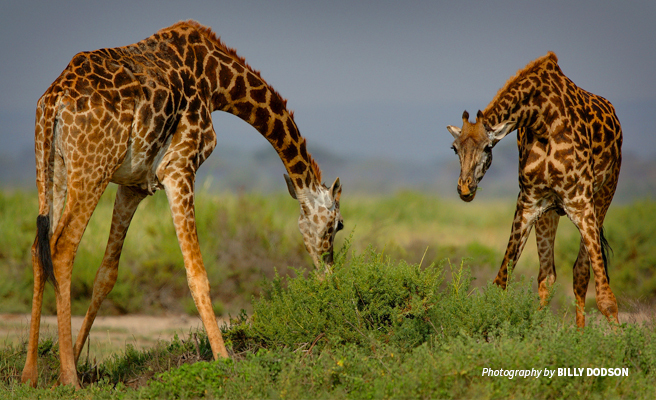 Apart from boosting the effective management of enclosed giraffe populations, reversing the current decline in giraffe protection is a key component of Kenya’s first-ever Recovery and Action Plan for the next five years. So far, African Wildlife Foundation has partnered with the Kenya Wildlife Service and other conservation organizations to gather accurate data and monitor population trends. Importantly, our land management approach in the Tsavo-Mkomazi landscape helps mitigate human-induced rangeland degradation to ensure that giraffes have enough space to grow. We also empower people who coexist with wildlife — from local sisal farmers to pastoralist groups — to adapt their livelihoods and prevent further habitat and population declines. For the wildlife scouts working at the frontline, we provide training opportunities to improve ecological monitoring and law enforcement. 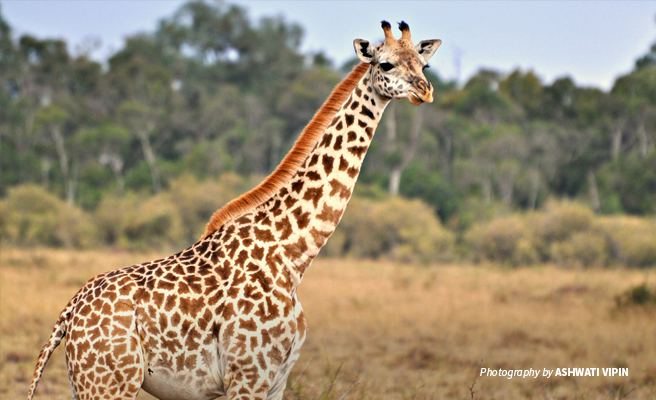 As Kenya advances its economic development agenda, AWF will continue to support community-led conservation to ensure that protecting threatened species like the giraffe drives sustainable growth at all levels. Philip Muruthi is African Wildlife Foundation's Vice President for Species Protection. He has worked with AWF for over 20 years, facing conservation challenges from a broad perspective. His role is to deliver strong and appropriate conservation science inputs to AWF's integrated conservation strategies that take into account landscape-level approaches, social issues, and economic issues. In addition, Philip represents AWF in the international conservation dialogue, such as at the Convention on International Trade in Endangered Species (CITES) and the International Union for Conservation of Nature (IUCN) World Conservation Congress. He is also a member of the Task Force on Kenya’s Migratory Corridors and Dispersal Areas as well as Kenya's National Giraffe Conservation Task Force.